Pre-packed cases are cheaper than buying 6 full-priced individual bottles. This bold organic Champagne brought home the Grand Gold Medal at the 2016 Mundus Vini International Wine Awards. Made with 100% Pinot Noir grapes, it’s full of fruity flavour, especially raspberries. A good backbone of acidity is tempered by a soft, creamy texture. All in all, this is one class act – lively, refreshing, and spot on for celebrations. Pre-packed case price is cheaper than buying 6 individual bottles. Keep in a dark, dry place. Serve chilled. Biodynamic since 1989, Champagne Fleury has always been a trailblazing estate. Located in the South of the Champagne region with vineyards located on chalky slopes on both sides of the Seine valley. In 1904 Emile Fleury was the first to plant grafted pinot noir vines in the area. In 1929 his son Robert took the plunge and decided to make single-vintage champagnes. 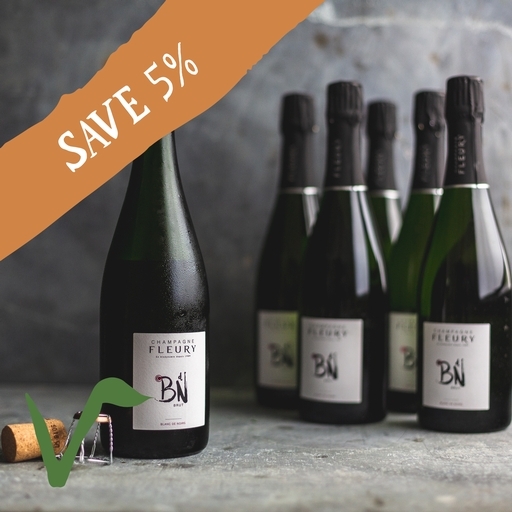 Subsequently, Jean-Pierre Fleury was the first grower in Champagne to convert to biodynamics producing the stunning champagne that we have selected today.